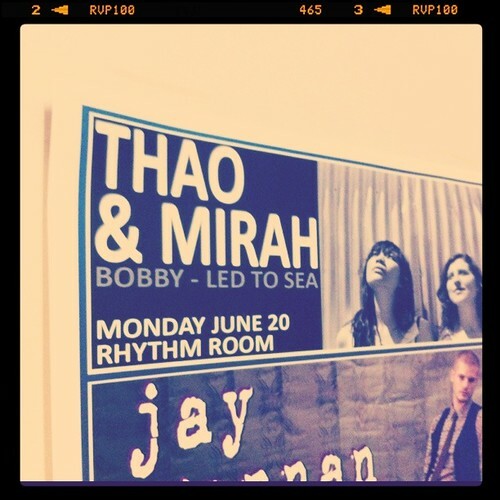 Mirah's always been a favorite of mine, so when I heard she and Thao were touring it was great news. I knew it would be a very special show, and I also knew it would be an evening I did not want to miss. 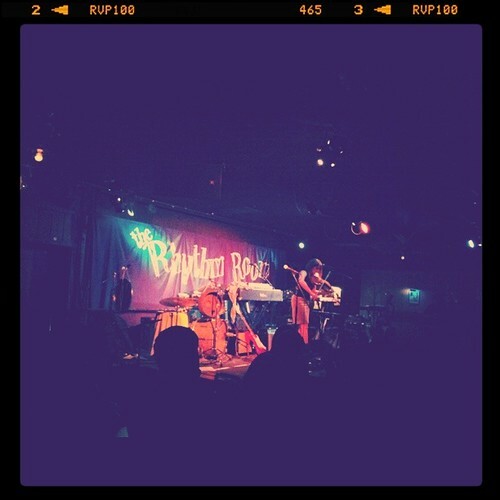 I wasn't familiar with either of the openers, but Sarah and I ending up falling in love with the second band, Bobby. Throughout their entire set we kept looking at each other with the biggest smiles on our faces. I absolutely loved them, and last night was exactly what I needed. You know how sometimes, you start to feel a little unlike yourself? Maybe you just feel off, feel uninspired, or just plain weird? So many times when I feel this way, all I need is a night with my girlfriends, enjoying live music. Music has a way of making me feel so many emotions; when I can sit in a packed room, and listen to beautiful voices and instruments and clapping and cheering, it brings me back to my senses, something that, at that moment, is connecting an entire group of entirely unconnected people. I feel new again. Last night was no exception. The three bands that played brought me back to my reality. I found myself closing my eyes as the music wafted up and over the people, the chairs, through the bar, and as it made it's way over to me and settled gently right into me, it became a part of me. It was perfect. a night out like that always makes me feel better too! i've never heard of either of those bands, so i'll have to look them up. your dress looks so gorgeous! i love the color and the bow in the front! pretty girl! So glad you had a fun night out!! I love Thao! I keep getting cruel e-mails about all sorts of upcoming shows that I can't attend! I will have to soak up the live music whenever I move back! Oh my goooodness I Love, LOVE, LOOOOOOOVE Mirah. J.E.A.L.O.U.S right now...or at least until I check to see if I can see her toooo! wow, yes. i can completely relate! i don't feel like myself when i've gone too long without live music. love love love mirah too. Glad you got a night out! 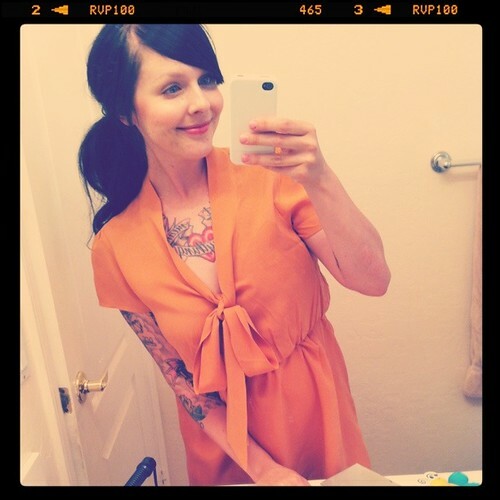 I love that dress too, so pretty! I feel this way about Pink Floyd, David Gilmour, My Morning Jacket, and Led Zeppelin. i love the rhythm room! it's a nice intimate venue, always a good time. you look completely gorgeous - I'm SO glad you had such a wonderful night! <3 xoxo! Omg you look gooorgeous!! Sounds like a great night! I loove them and when I read about their collab I was so excited. I have their first press release on vinyl, and so happy I got them. So jealous you saw them!! They played here when I was out of town. I can go on forever, Dani! Love the dress you wore, too. I get it. I get you. There are times when it really kills me to be all the way across the country from my dearest girlfriends because our moments which you just described are so rare nowadays! Uh, I love them! I hope they will come in Italy! It was such an incredible concert! I've been waiting to see both of them for a while. I chatted with Thao after the show, and she is the sweetest, most down to Earth girl ever! I also fell in love with Bobby and wanted to hear more! Stupid mic issues! 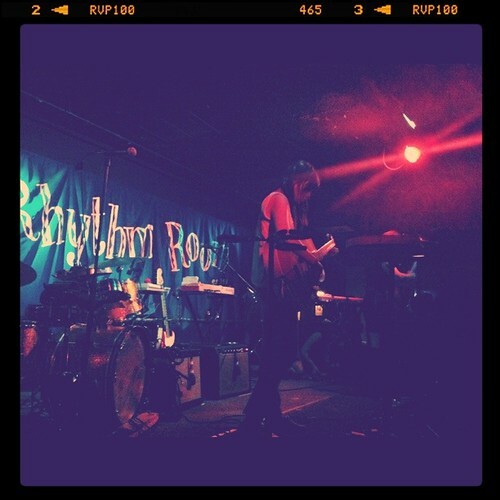 The Rhythm Room continues to be my fave venue in Phoenix. Hooray for Phoenix's live music scene! i know exactly what you me & im glad you had so much fun and got out. now i need to plan more outings! looks so fun!